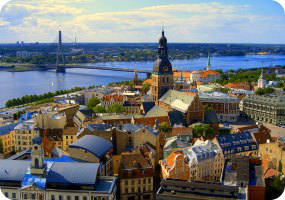 Book now the best shore excursions in Riga. High quality and safety at the lowest prices. If your are looking for Shore Excursion Riga, book now the best guided tours at lowest price with Ancora Tours. Since 2003 we offer you official guides in english, transportation and travel insurance, all included. The highest quality at the lowest rates. Riga is the largest city of the Baltic states and home to one third of the Latvian population. Surprise yourself with this shore excursion and discover its stunning historical centre with beautiful Art Nouveau buildings and 19th century wooden architecture. What’s eating: Rupjmaize; a dark bread made from rye. Souvenir: Riga Black Balsam; a herbal liqueur said to alleviate hangovers and stomach aches. We’ll leave the port by coach to reach the city centre of Riga. Our shore excursion starts in the spectacular historic centre, a UNESCO World Heritage Site, noted for its Art Nouveau and 19th century wooden architecture. We’ll admire the religious architecture of St. Peter’s Church, Riga Cathedral and the Church of Santiago. Then, the Latvian National Opera House and the greenery of Bastejkalns Park. Not far away are the Three Brothers Houses; three buildings which each characterize a different architectural style. The first, built in the 15th century, has Gothic decorations. The second shows influences from Dutch Mannerism. The third house displays the Baroque style and is today the Latvian Museum of Architecture. Our Riga shore excursion continues with a visit to the splendid façade of the House of the Blackheads. Next we’ll see the Freedom Monument, a 42metre high memorial to those killed in the Latvian War of Independence. We’ll finish the shore excursion with an outside visit to Riga Castle. This fairytale structure sits on the river banks and today is the official residence of the President of Latvia.